Women's cross country pushes off the starting line at the Youngstown Regional Championship Oct. 31. The Raider football team huddles before a play Oct. 3. 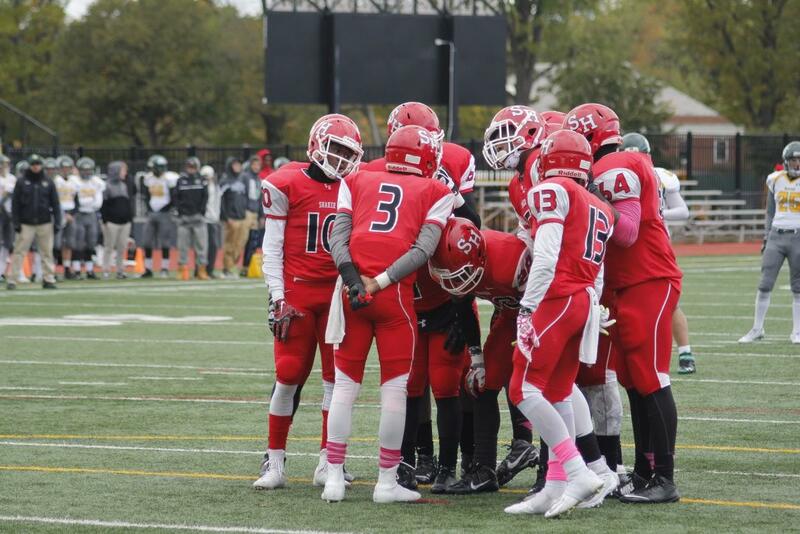 Raider football bounced back from their 1-9 season in 2014 and started the 2015 season on fire. Shaker football started 3-0 with a key win over US (21-9) and blowout wins over JFK (50-0) and East Tech (42-0). 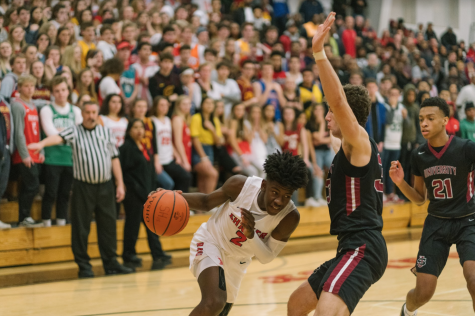 The Raiders slowed during the middle stretch of the season, losing seven consecutive games to powerhouses including Mentor, Strongsville, Solon and Elyria. With the departure of key 2014 players, Raider underclassmen have been forced to step up. One of the underclassmen to rise to the occasion was sophomore Jamir Dismukes, who won the starting QB job during the preseason and had impressive performances in the Raiders’ wins including 200 yard passing and 2TDs through the air against East Tech. Key players for the Raiders much improved defense include seniors DB Delone Williams, LB Xavier Johnson and lineman Gary Harris. Senior WR Marcus Carthon was one of Dismukes’ top receiving targets. 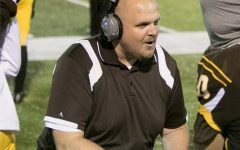 Raider football did not qualify for the playoffs this year but the program has definitely taken a step forward from their disappointing 2014 campaign. 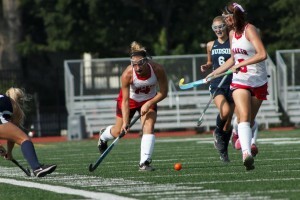 Senior Jessica Morford carries the ball in a match against Hudson. Raider field hockey followed up their 2014 state championship season with another impressive regular season campaign in 2015. The Raiders finished with an 11-4 record. 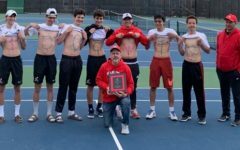 Key wins for Shaker include a 3-0 shutout of arch-rival HB at the home opener, a 1-0 win over top ranked North Allegheny (PA) and dominating 8-0 and 10-3 wins over Kent and Cleveland Heights. The Raiders only had one loss to teams in Cleveland (a 3-2 overtime loss to Hudson) and earned the No. 2 overall seed in the district. Key players for the Raiders included sophomore forward Drew Hubbard and junior midfielder Meagan Mitchell who were among the team leaders in goals. 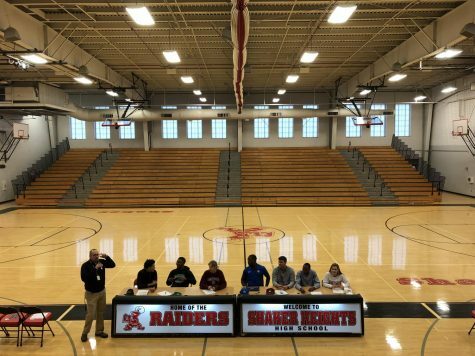 Senior defensive backs Bridget Mitchell and Colleen Bradley helped lead the Raiders’ stifling defense and senior midfielder and Indiana commit Jessica Morford was the focal point of the team on both offense and defense. In contrast to last year’s stellar playoff campaign, the Raiders ended their season with a heartbreaking 0-1 overtime loss to Hudson in district finals. Junior Jack Sullivan plays during a Sept. 8 loss to St. Edwards. After last year’s historic season, men’s soccer slowed their pace a little, starting the regular season 0-3. However, the Raiders rebounded after their rough start and finished the season 9-5-2, at one point winning four straight games and remaining undefeated during the month of October. 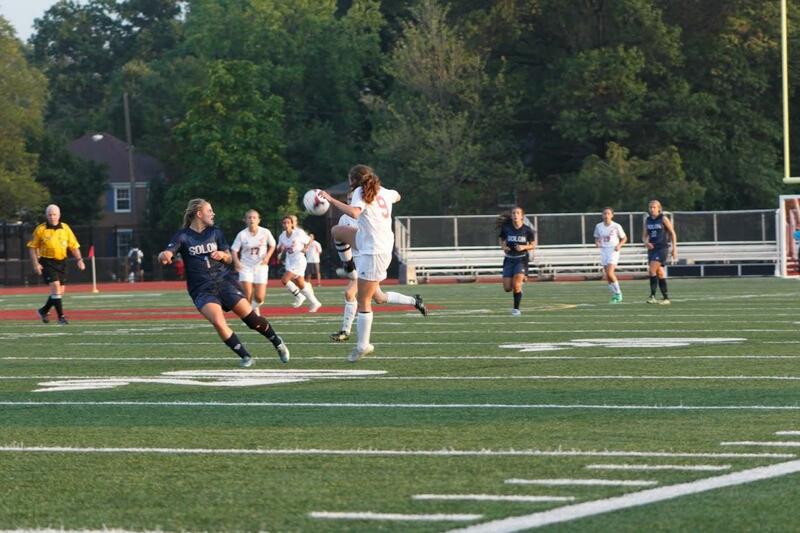 The Raiders had key 2-0 and 4-2 wins over rivals Mentor and Chagrin and had an impressive 15-0 rout of Euclid. 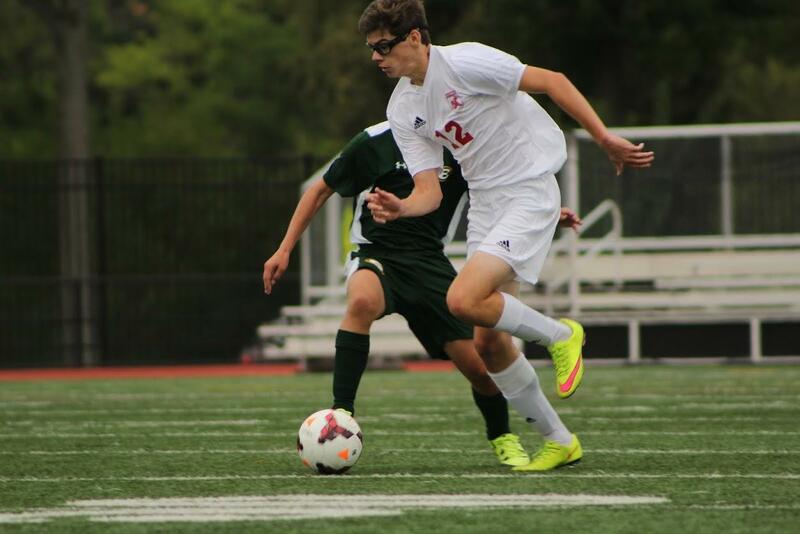 Key players for the Raiders included senior forward Jason LaMonica and junior midfield Brendan Frothingham, who were two of Shaker’s biggest offensive threats. Senior Evan Pascarella and sophomore Ethan Adams helped lead the Raiders on defense and senior goalie Vincent Prochoroff had impressive performances throughout the year, including shutouts against Chagrin, Euclid, Orange and Cleveland Heights. The Raiders entered the playoffs again as a favorite to win their district, and they did so, becoming district champions after defeating seventh-seeded Riverside 2-0 in the district final. Senior Captain Abbey Bugenske receives a ball in a Sept. 3 game. After having a winning record last season, women’s soccer retreated to a 5-7-3 record. Though the Raiders had fewer wins than last year, they lost the same number of games (7) and held their own against top ranked teams. For example, the Raiders tied with powerhouse Solon, one of the best teams in the region. The Raiders also defeated Orange 3-1, Euclid 9-3 and destroyed Valley Forge 8-0.Key players on offense for Shaker included forward and senior captain Abbey Bugenske, sophomore Enna van den Akker and junior Lauren Smith. On defense the Raiders were led by senior captain Helen Yusko, sophomore Allison Stewart and junior captain Margaret Cook. Senior captain Sara Mesiano also was a key contributor on both offense and defense as a midfielder. 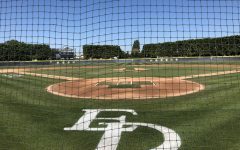 After being seeded fifth in their district, The Raiders defeated Valley Forge 3-0 in their first round playoff game but lost their next game against fouth-seeded Lakewood 2-1. After Bugenske scored goal in the last 40 seconds to tie the game, the Raiders were defeated during the golden goal overtime. Senior Justyn Moore runs at the Youngstown Regional Meet. After graduating three seniors from the 2014 varsity lineup, men’s cross country relied on a young team to regain lost ground. Freshmen Zak Reape and Matt Burnard stepped up to run varsity for the Raiders, both having promising seasons. Junior Ryan Duffet was also indispensable for the Raiders. 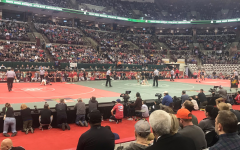 Hit hard by the loss of Senior Jonah Ricanati to injury, the Raiders did not place in any invitationals this season, and failed to build on last year’s regional qualification. 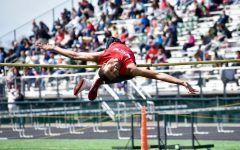 The Raiders finished their season at the district meet, placing fifth and missing out on a regional qualification by eight points. 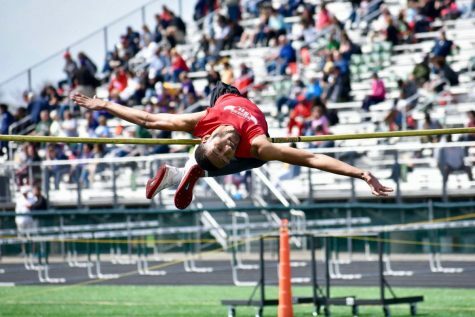 Senior Justyn Moore continued to improve after his all-Ohio 2015 track season. Impressive performances included a first place finish out of 156 runners at the Todd Cloverleaf Invitational and a sixth place finish out of 223 runners at the Legends Meet. Moore’s 16:02.11 personal record at the Tiffin Invitational was a new school record for 5000m. 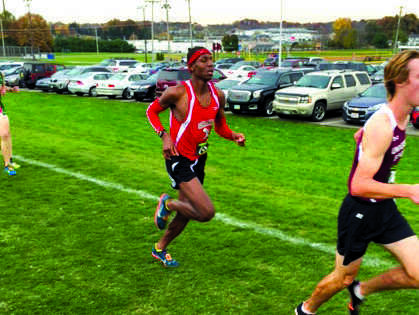 After qualifying for regionals individually with a third place finish at the district meet, Moore’s 12th place finish at the Boardman Regional Meet made him the first Shaker boy to qualify for the state meet in nine years. 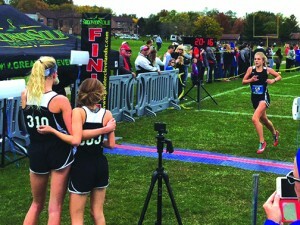 Junior Mimi Reimers and sophomore Sophie Carrier watch teammate sophomore Alexa Jankowsky cross the finish. 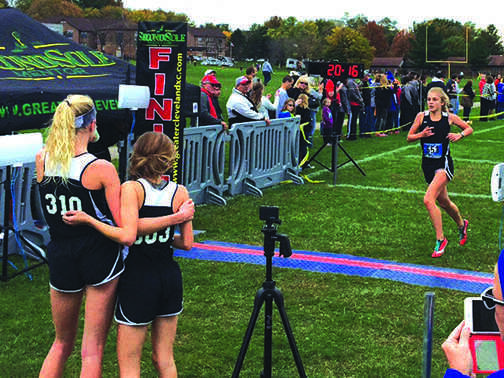 Women’s cross-country relished a 2015 season full of historic successes. The team started strong, with a first place finish at the George Clements Invitational. The winning streak continued throughout the season, with the Raiders never placing lower than third in any regular-season meet. Key team performances included third place finishes out of 36 teams at the Tiffin Cross-Country Carnival and the Boardman Spartan Invitational. After another third place finish at their conference meet, the team started their postseason with a district championship. Five runners placed in the top 15 and junior Mimi Reimers and sophomore Sophie Carrier finished first and second, respectively. 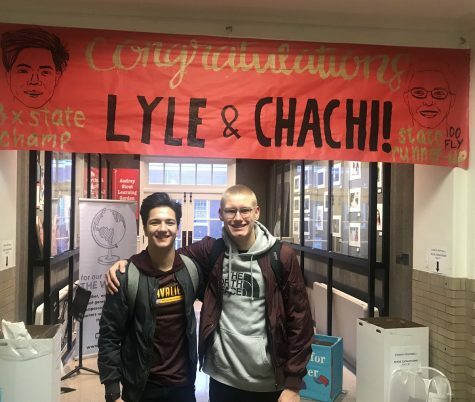 The team then finished fourth at the Youngstown Regional Meet a week later, making them the first cross-country team to qualify for States in Shaker history. Individually, Reimers continued her distance-running dominance. Her 5000m time of 18:38 at the Legends Meet is a school record and her third place finish at the Youngstown Regional Meet was the highest ever regional finish for a Shaker runner. The team has also been bolstered by strong performances from Carrier with a best time of 18:48 and sophomore Alexa Jankowsky with 19:11. 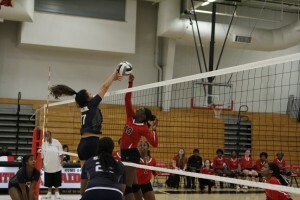 Women’s volleyball fights for points in a match against Solon. Raider volleyball took a step back from last year’s campaign, finishing with a 3-17 regular season record. The Raiders were 1-12 in conference play but did have impressive wins in their nonconference schedule. The Raiders defeated rival Laurel 3-2 in five games after mounting an impressive come back from a 0-2 deficit. Other highlights in their season included a second-place finish at the Beachwood Invitational, where they had key 2-1 wins over Fairview and Garfield Heights. 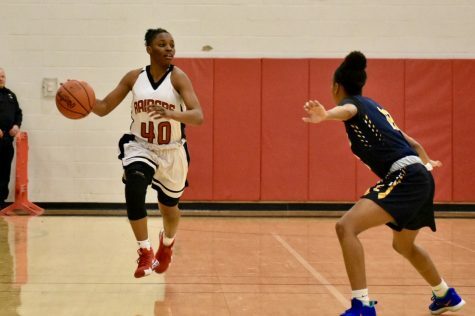 Key players for the Raiders included senior captain Nya Hardaway and junior Cydney Calhoun. 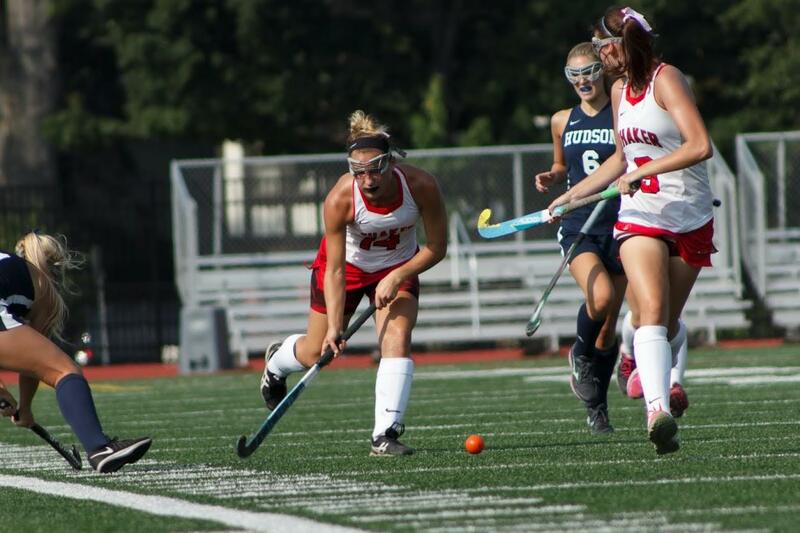 Sophomore Sydney Fieseler and junior Anna Dietz were also key contributors for Shaker. The Raiders entered playoffs with a ninth place seeding. 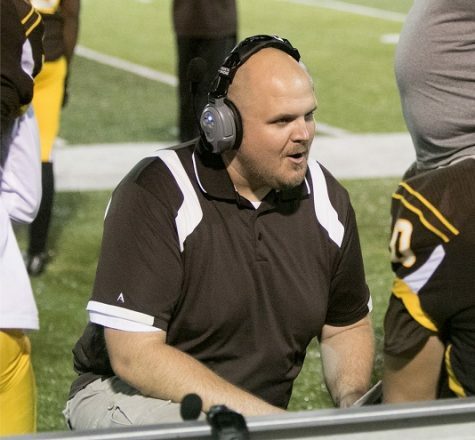 Ater advancing to the second round of playoffs in 2014, the team was placed in a new district and failed to get past the first round. The Raiders lost to fifth-seeded Mayfield 3-0. Shaker will look to improve this offseason and get back to their winning ways for 2016 season. 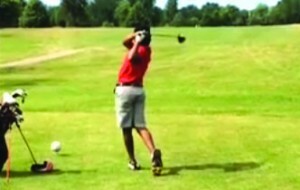 Sophomore Kayin Claytor follows through after a swing. Raider men’s golf took a major step back from last years undefeated conference record and Lake Division championship. The Raiders finished their season placing 12th out of 17 teams at OHSAA Sectional Tournament. The lowest scorers for the Raiders were Juniors Liam Siwik and Ryan Wheeler. The team had a combined score of 368. 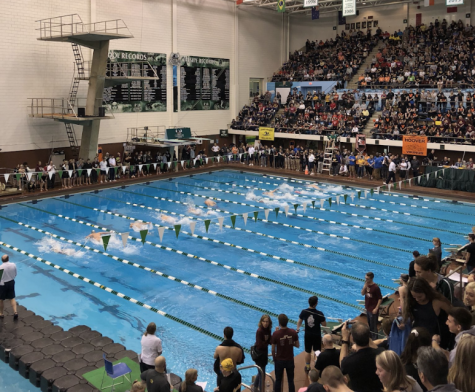 The team placed sixth at the Greater Cleveland Conference tournament, a more competitive conference than the Lake Division of the Northeast Ohio Conference the team was in last year. 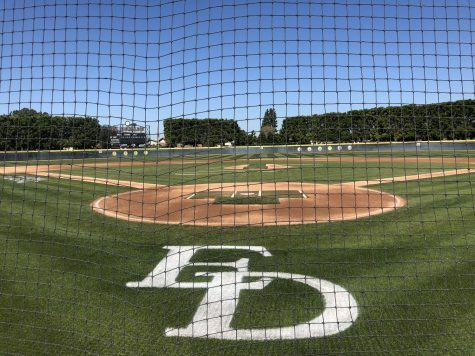 Throughout the season, all players recorded personal best nine-hole and 18-hole scores and finished the season with a 2-14 record and a 0-10 conference record. Wheeler and Siwik were both key contributors on the varsity squad. Wheeler’s nine-hole score of 34 was the lowest score Shaker has seen in seven years. Raider golf will look to improve this offseason after this year’s subpar campaign. Sophomore Maggie Dant prepares to swing during a tournament. 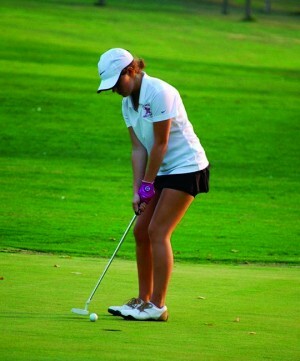 Women’s golf opened their season with a sixth place finish at the GCC pre-season tournament. After falling to Medina in their season opener 172-216, the Raiders rallied to score some key victories as the season progressed. 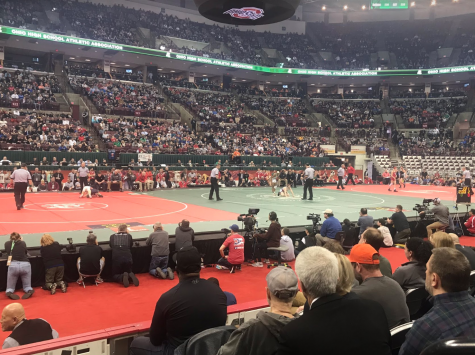 Highlights included a close 202-222 win against Cleveland Heights and a 198-234 victory against Mayfield. Women’s golf finished their season with a 12th place finish out of 16 teams at their Ellsworth Meadows Sectional Tournament on October 6. The result was an improvement off their 2014 13th place finish, but still wasn’t enough to advance the Raiders to the district tournament. The Raiders were led by senior Hannah Ruhoff and sophomore Bethany Lowenkamp, posting 104 and 105 points at districts, respectively. The team will have to work hard this offseason to improve for 2016. 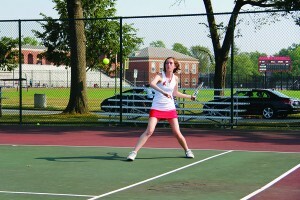 Senior Claire Hummel returns the ball during a match. 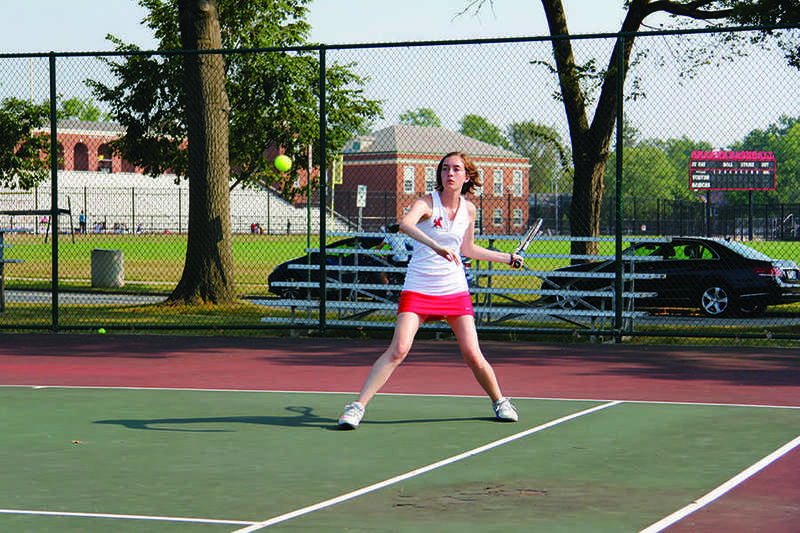 The women’s tennis team had a balanced 2015 season. The Raiders finished with a 10-10 record similar to the 7-7 record from last season. Throughout the season, key wins included a 3-2 win against Hathaway Brown, a 4-1 win against Brunswick and a 5-0 win against Strongsville. Underclassmen played a vital role in the team’s success this year after losing Hillary Lacks (‘15) and Quinn Frierson (‘15). Key players included freshmen Katrina Cassell, sophomore Trisha Roy, sophomore Sarah Moran, freshmen Elizabeth Cole, and senior Allison Kao. Shaker tennis finished up the season after sending a doubles team comprised of senior Allison Kao and freshman Katrina Cassell to the OHSAA District Tournament. The duo placed third at the Sectional Tournament upsetting the No. 4 seeded team. Last year no Raiders qualified for the district match. Kao and Cassell fell to Walsh Jesuit in the first round of the District tournament.